This article is a short summary of Diddy Kong Racing DS. Diddy Kong Racing DS boxart. 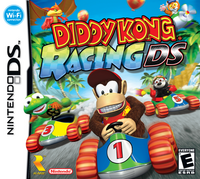 Diddy Kong Racing DS is a racing game developed by Rare for the Nintendo DS. It is Rare's first Nintendo DS game, and was released on February 7, 2007, in North America, April 20, 2007, in Europe and April 19, 2007, in Australia. It is a remake of the critically acclaimed Nintendo 64 game Diddy Kong Racing. Diddy Kong Racing DS makes use of the Nintendo Wi-Fi Connection, as well as the microphone for various features in the game, and the touch screen to create race tracks. Although some of the tracks underwent minor changes, they remained nearly identical to the N64 version. Unlike its predecessor, it was never officially released in Japan. Pokémon Battle Revolution • Pokémon Battrio • Pokémon Dash • Pokémon Diamond and Pearl • Pokémon Mystery Dungeon: Explorers of Time and Darkness • Pokémon Mystery Dungeon: Red and Blue Rescue Team • Pokémon Ranger • Pokémon Trozei! This page was last edited on 13 October 2018, at 18:34.